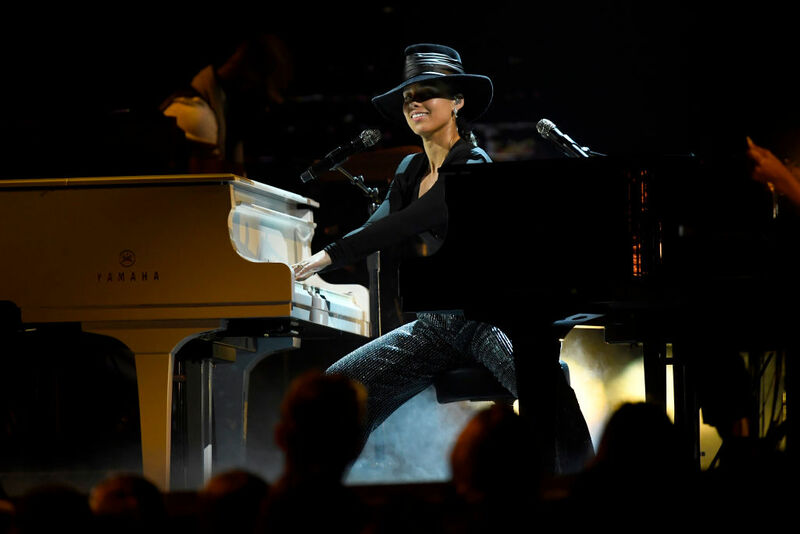 This year's Grammys was definitely a spectacle to behold, with show-stopping performances, incredible medleys, and Alicia Keys playing two pianos at the same time! 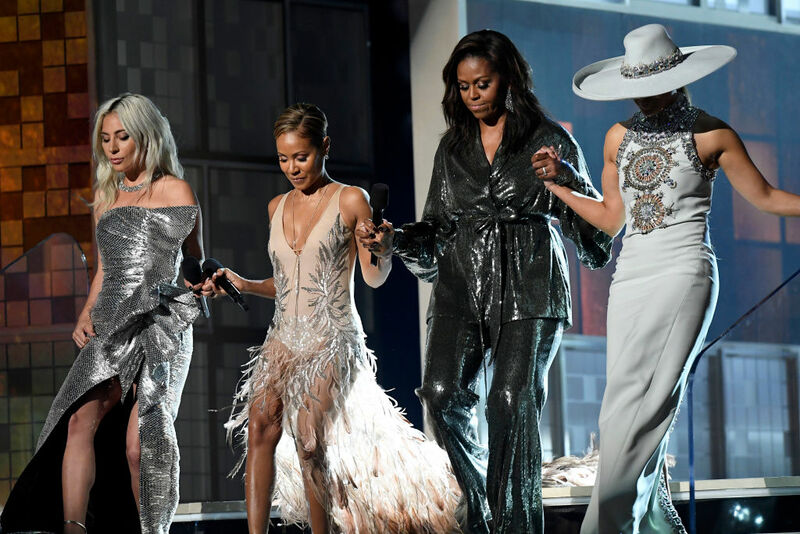 But the most hair-raising moment of the night was when Michelle Obama surprised everyone at the beginning of the show. The former First Lady stunned the star-studded audience as she walked onto the stage at the Staples Center in Los Angeles on Sunday night in a dazzling Sachin & Babi outfit, which featured a billowing silver blouse with matching slacks, along with a sparkling belt wrapped right below her bust, reports Daily Mail. And she looked absolutely glamorous as she stood alongside Lady Gaga, Jennifer Lopez, Jada Pinkett Smith, and Keys to discuss how music has always helped her tell her story. "Music helps us share ourselves, our dignity and sorrows, our hopes our joys," she said. "From the 'Motown' records that I wore out on the Southside to the 'Who Run The World' songs that fueled me through this last decade, music has always helped me tell my story and I know that's true for everyone here," she began, throwing in a quick tribute to Beyonce while the audience went wild with excitement. She continued, "It allows us to hear one another — to invite each other in. Music shows us that all of it matters... every story within every voice, every note within every song." Before Michelle, it was Alicia Keys who began her monologue by paying her tribute to music. "Music is what we all love, music is what it's all about," she said. "Everybody is out here shining and I'm so proud to bring us together to honor this moment because music is what we cry to, it's what we march to, it's what we rock to, it's what we make love to. It's our shared global language." Keys continued, "It's our shared global language, and when you really want to say something, you say it with a song, am I right? Or am I right? So, let's just be honest. This is a celebration, and y'all didn't think I was coming out here by myself, did you? Please, can I bring some of my sisters out here tonight?" It was then that one by one, Lady Gaga, Jennifer Lopez, and Jada Pinkett Smith started to come in and talk about their understanding of music and what it represents for them. Lady Gaga said, "They said I was weird. That my look, my choices, my sound — that it wouldn't work." She continued, "But music told me not to listen to them. Music took my ears, took my hands, my voice and my soul and it led me to all of you and to my little monsters who I love so much." It was then that Lopez revealed that music gave her a "reason to dance" during her growing years in the Bronx. "From hip-hop to freestyle, pop, soul, and salsa. And it kept me moving and it kept me moving from the block to the big stages and even bigger screens," she continued. "It reminds me where I come from, but it also reminds me of all the places I can go. Music has always been the one place we can all feel truly free." Meanwhile, Jada Pinkett Smith discussed how music to her has always been like a window to the different lives that people lived around the globe. "We express our pain, power, and progress through our music whether we're creating it or just appreciating it," she said. "But here's what I know: every voice we hear deserves to be honored and respected." 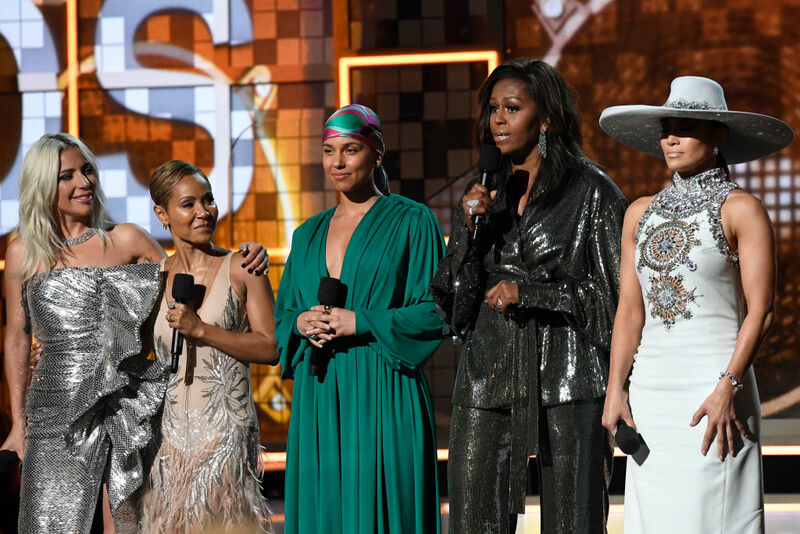 After the event, the former FLOTUS took to Twitter to congratulate and pay tribute to Alicia Keys and also share a photo of herself with her co-presenters backstage. 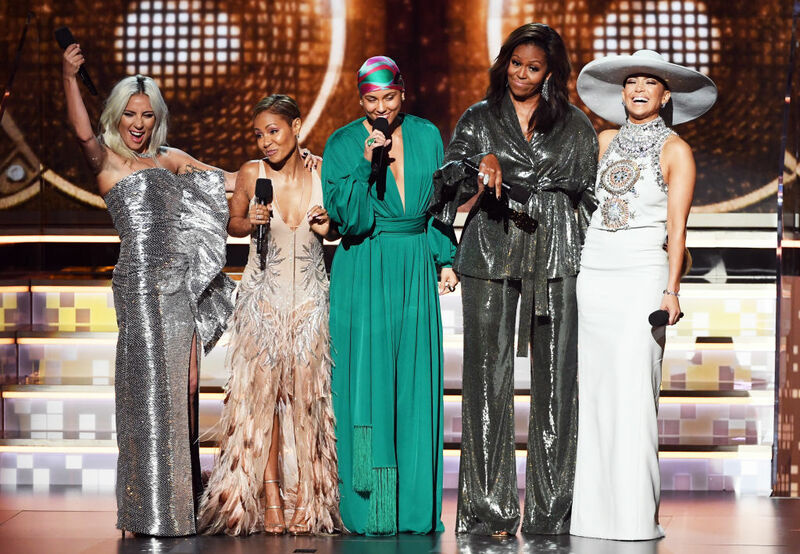 "A big part of friendship is showing up for your girls — that's why I was thrilled to be there for the one and only @aliciakeys at the #GRAMMYs," she wrote. "She is one of the most genuine and thoughtful people I know — there's no one better to help us all celebrate the unifying power of music."